Collections by Weiser offers five handlesets to choose from. These handlesets offer solid forged brass construction and Grade 1 cylinders for uncompromised security. The Key Control Deadbolt is perfect for multi-family dwellings, student housing, assisted living & rental properties. Weiser's Key Control Deadbolt, featuring SmartKey<sup></sup> Re-key Technology, is a revolutionary cost and time-saving alternative to master keying. With the first and only two-cylinder Key Control Deadbolt, either cylinder can be re-keyed in seconds, without removing the lock from the door. Retain your one-key access to all units and gain more flexible key management, all while saving time and money. This single cylinder deadbolt can be locked or unlocked by a key on the outside, or the turn button on the inside. The Satin Chrome finish gives the product a modern and minimalist look. Baldwin has a 60 year legacy of craftsmanship and innovation. Rated #1 in quality by builders and contractors, Baldwin is pleased to offer a line of luxury hardware for the discriminating consumer, our Prestige Series. Feel the difference - Baldwin hardware is solid throughout. With a 60 year legacy of superior style and quality, Baldwin is the choice for an elegant and secure presence The Venetian Bronze finish is hand-rubbed to reveal unique bronze highlights and provides a rich and warm complement to the product's style. This double cylinder deadbolt can be locked or unlocked by a key on the outside and inside. Adding security for your family and property is easy with this reliable electronic deadbolt. Defiant keyless entry technology brings peace of mind without the worry of losing keys. Its user-friendly features offers ease of installation, operation and customizable programming and is backed by a 1 year electronic warranty. Featuring a Lifetime Guarantee, Defiant meets or exceeds ANSI Grade 3 Standards for residential use. This lock features a drive in latch with an adjustable backset and optional radius cut faceplate . The Powder coated finish will provide years of durability. When used as a replacement lock only a screwdriver is need to make installation a snap. These locks can be re-keyed to fit your existing KW1 keyway. Please speak with your local Home Depot associate for further details on this process. 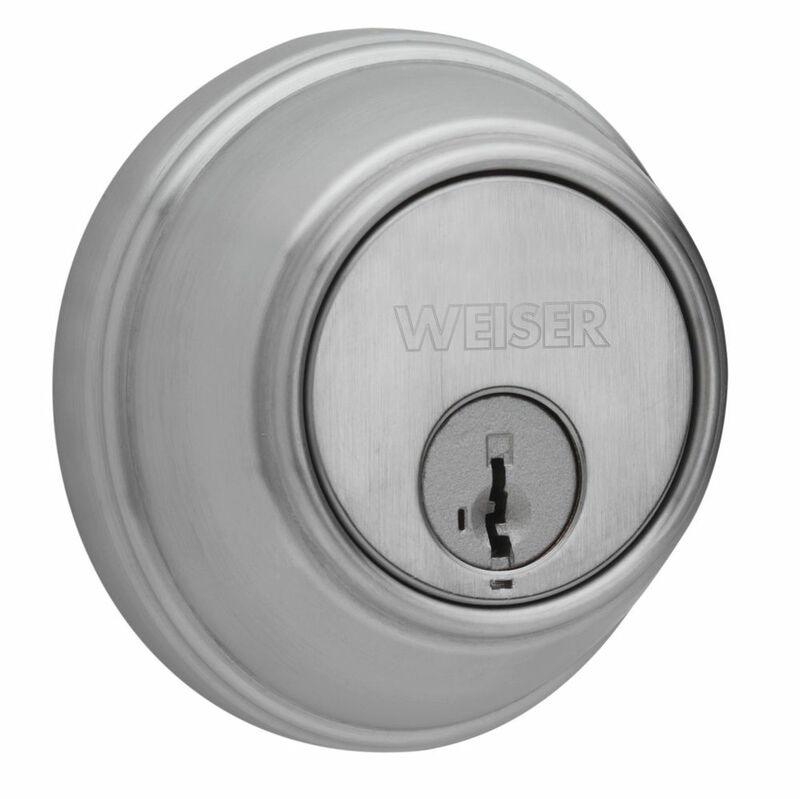 Satin Chrome Single Cylinder Key Control Deadbolt Collections by Weiser offers five handlesets to choose from. These handlesets offer solid forged brass construction and Grade 1 cylinders for uncompromised security. The Key Control Deadbolt is perfect for multi-family dwellings, student housing, assisted living & rental properties. Weiser's Key Control Deadbolt, featuring SmartKey<sup></sup> Re-key Technology, is a revolutionary cost and time-saving alternative to master keying. With the first and only two-cylinder Key Control Deadbolt, either cylinder can be re-keyed in seconds, without removing the lock from the door. Retain your one-key access to all units and gain more flexible key management, all while saving time and money. This single cylinder deadbolt can be locked or unlocked by a key on the outside, or the turn button on the inside. The Satin Chrome finish gives the product a modern and minimalist look.